Using the earlier custom pie shape control as a base, we can now create a custom control that serves as a circular progress indicator. (startAngle - endAngle) > 180,   // greater than 180 deg? 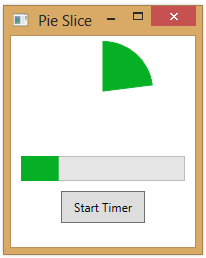 Here’s an example of using this control in XAML. The example also includes a traditional progress bar, so that we can compare them. Finally, here’s the code-behind, including the PctComplete property that we bind to and code that kicks off a timer that updates the property periodically. #1,155 – A Circular Progress Indicator has been a wonderful example. I am a newbie to WPF and I am using this a tutorial. I am unable use this part of the code. In fact I fail to understand. Please explain How exactly does this part of the code work? What does tag do in XAML?